The interior of the W Hotel, Brisbane. Big, bold and brash has come to Queensland and Celeste Mitchell checks into the new W Brisbane to see if the sunshine state is ready for it. If there’s one thing the Brisbane CBD has been accused of lately, it’s not of being a show pony. The all-night parties are in Fortitude Valley, the eating and small-bar-hopping is happening in West End and South Brisbane, and the headlines are most likely coming from QAGOMA or Suncorp Stadium. That is, until the W Brisbane opened its doors to the debaucherous, unabashed flauntiness that dwells within. It’s got a lot of hype to live up to, being Brisbane’s first five-star hotel in 20 years, and all. The pool inside the W Hotel, Brisbane. And there’s a lot going on in the river city right now. Just down the street, The Star Entertainment Group’s ambitious $3 billion Queens Wharf development is redefining the northern side of the Brisbane River, giving its bridge-linked neighbour, South Bank a run for its money with several five-star hotels, 50 new restaurants and bars, and a brand new casino to open by 2022. W picked the Queensland capital for its dramatic re-debut into Australia before making a promise to pop up in Sydney and Melbourne, which is a shot of confidence for the often overshadowed state. “Brisbane is a dream destination – year-round sun and an outdoor lifestyle – it’s quickly evolving into one of the world’s greatest cities which is why W is kicking off the brand’s return to Australia here in the Sunshine State,” said Bruce Ryde, Vice-President for Luxury Brands and Brand Marketing, Marriott International Asia-Pacific. It’s unlike anything Brisbane has seen before. And we count Pauline Hanson as a resident. 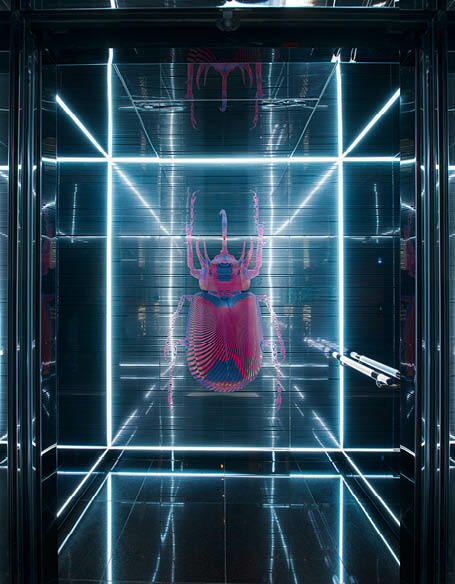 The neon elevator inside the W Hotel, Brisbane. My husband and I arrive straight from highway congestion into a $58 valet parking fee on a Thursday afternoon but somehow my mood doesn’t slip into ‘seriously shirty’ once we’re inside the shiny new lobby. Ripe with riparian themes in the design, it starts with a staircase of timber river reeds delivering us to the Welcome Desk and continues through to the carpet pattern in our room, inspired by the shifting tide patterns of the Brisbane River. Quirky decor inside the W Hotel, Brisbane. 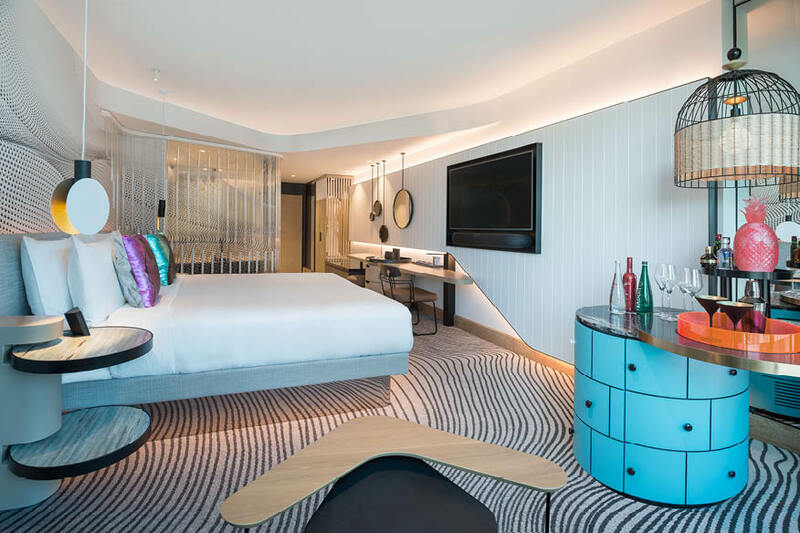 Checked-in, we’re shown to the moodily-lit elevators, inside which an iridescent 2.5-metre beetle beams back at us and it’s abundantly clear – this is no place for minimalists. 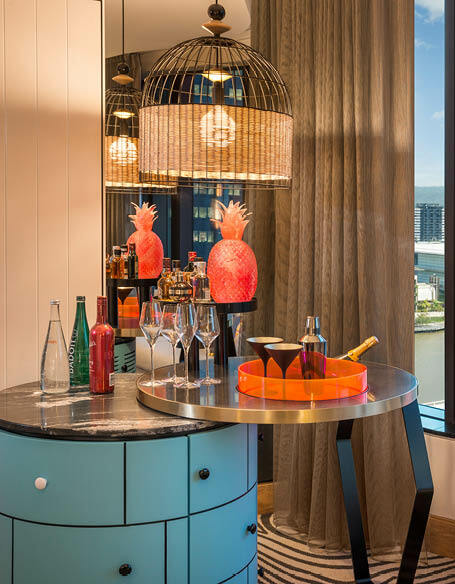 The curtains automatically draw back as we enter our Wonderful Room, allowing the sunset to pour over its showpiece: a turquoise circular mix bar, topped with a hot pink glass pineapple and enough mid-sized bottles of booze to get a little rock star. But before we reach it, I’m tempted to pull open the birdcage-like wardrobe and go-go dance with a waffle-weave bathrobe, on its marble platform. One of the rooms of the W Hotel, Brisbane. The room snakes from the entrance, past the bathroom with its ‘10-gallon drum tub’ inspired by the Aussie outback, around the end of a king-size bed and into curved floor-to-ceiling glass. Along one wall, white VJ panels bring a touch of traditional Queenslander home; opposite is a shimmering print with thin glass poles running along it, channelling mangrove reeds. There are mirrors everywhere. Now I know how Diddy felt in Get Him to the Greek, when he just wanted to stroke the furry wall. All this ostentatiousness is new to me; it’s my first initiation into the world of W. On one hand I love it, on the other I feel like I’ve emerged from a tornado with Toto and I’m feeling conscious about my outfit choice. I wonder: Do I need an $8000 hand-dyed ostrich feather lamp in my life? Or a gold-plated life-size wallaby? 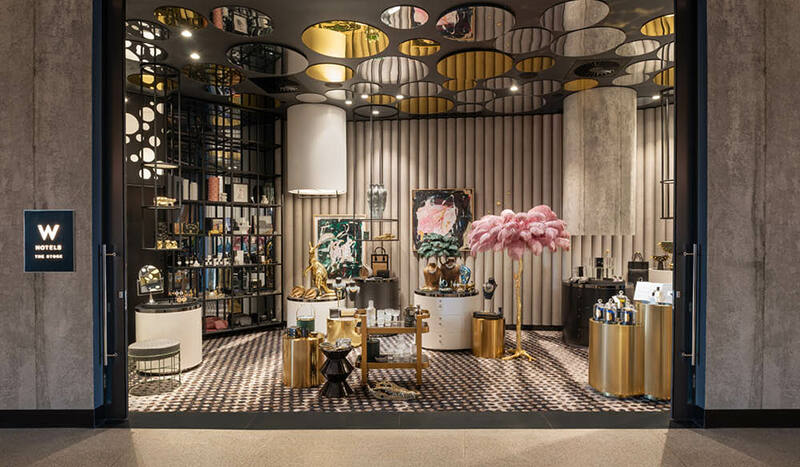 These are both legitimate questions to ask yourself at the W Store – the first partnership outpost for Sydney’s Becker Minty back on the lobby level. I mentally file a gold-dipped crab claw bottle opener for an upcoming birthday and continue to the Living Room bar, which backs onto the adjoining new shopping complex, Brisbane Quarter, for a cocktail. 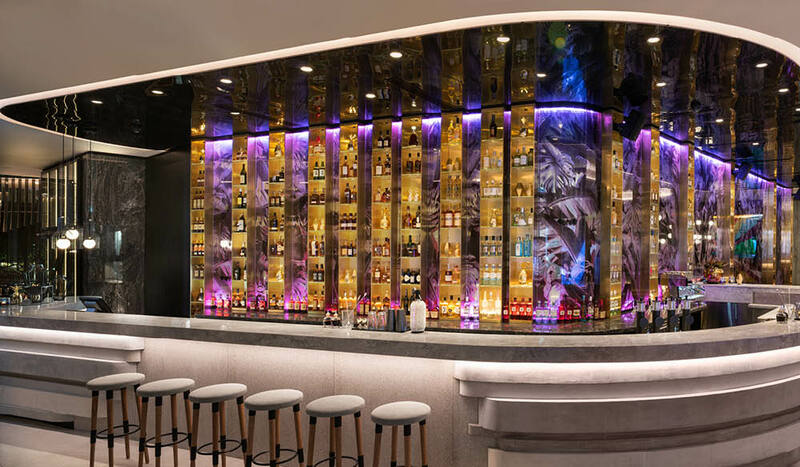 The incredible bar at the W Hotel, Brisbane. It appears locals are most excited about the restaurant on level four. The boys from Byron Bay’s Three Blue Ducks have made their Queensland debut with a cheeky ‘Swooping Magpie’ cocktail and sustainable and biodynamic wines on the drinks list, and mains char-grilled over coals or pulled from a wood-fired oven. Having not made a booking, we’re lucky to score a later seating. The question is, is BrisVegas edgy enough to handle the W’s psychedelic WET Deck pool and bar? Architecturally savvy enough to appreciate there’s not one straight wall in the place (or window for that matter)? And discerning enough to know the coal-grilled Moreton Bay bugs from Three Blue Ducks will almost put the W on the map alone? Verdict: Luxury without the stick up its behind, the W is like a hedonistic travel buddy you’d fly to Ibiza with. We rated: The fact there’s absolutely nothing else like it in Brisbane (yet). We’d change: I so wanted the service to shine but while everyone was bubbly and welcoming on arrival and in the spa and store, it became slightly more bumbling (and slow) in the bars and restaurant. Notes: We paid $314 for a Wonderful Room on the night of our stay and $58 for valet parking. Woah this hotel is pretty mad! Looks like a lot of thought has gone into its styling. It’s not exactly my cup of tea but it is very impressive.